With our harsh winter it is not a big surprise that the whole family undergo multiple waves of cold and flu with their constant attributes like sore throat, running nose and coughing. This winter we were lucky to receive Pine Bros. Softish Throat Drops in all available varieties including Natural Honey, Wild Cherry and Licorice to help us sooth sore throat and battle cold weather outcomes. Looking back into the history of creating soft drops by Pine Brothers, which were first introduced to public 140 years ago and became unbeatable favorites since 1870. Mr. Pine, a former German confectionery maker, combined the soothing qualities of glycerin with the healing properties of gum acacia to create a quick throat relief. Pine Brothers wish to reduce and sooth the discomfort of a sore throat turned into the most successful and most delicious throat lozenges in the world. After long years, company’s multiple ups and downs, we still receive throat drops made according to the original Pine Brothers recipe. I used to take hard throat lozenges and never thought it could be done differently until I tried Pine Bros. Softish Throat Drops. I think the main advantages of the Pine Bros. drops that they are very soft and healing. From all the varieties of the soothing, made of natural ingredients drops our favorite became Wild Cherry. It is delicious and tastes like real cherry with soothing effect. I am also looking forward to the new Lemon-Citrus flavor coming out next year, I am sure it will be a big hit same as other Pine Bros. Softish Throat Drops. 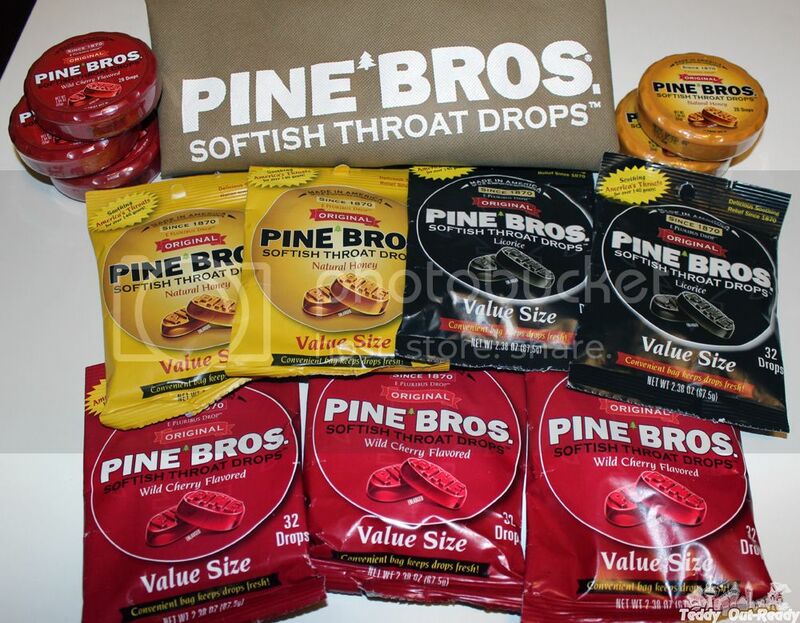 Talking about packaging, Pine Bros. Softish Throat Drops come in bags and pucks. For some reasons pucks became more preferable than bags among our family members, probably because they remind hockey pucks (and our guys love hockey) or simply, they can easily fit any bag and pocket. The Pine Bros. Softish Throat Drops are the best to use for adults and kids 3 years and over. So Teddy can join Pine Bros. Softish Throat Drops fans too. For more information, find Pine Bros. Softish Throat Drops on Facebook and Twitter.